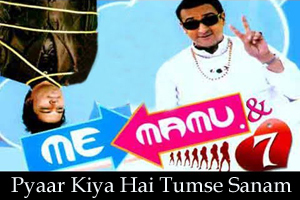 Lyrics Of Pyaar Kiya Hai Tumse Sanam From Movie - Me Mamu & 7 (2011): A Romantic song sung by Shaan and Music has been Composed by Sanjay and Vishal. The Audio of this song is available on Youtube at the Channel music centered station. The Audio is of 4 minutes and 09 seconds duration. Lyrics of "Pyaar Kiya Hai Tumse Sanam"
Lyrics in Hindi (Unicode) of "प्यार किया है तुमसे सनम"